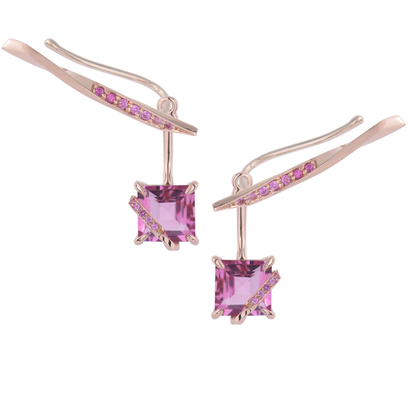 Rosy pink sapphires complement these exquisite, 7mm square cut, vivid pink tourmaline pendants. The pendants can be adjusted to hang at 2 different lengths to accommodate different ear lobe sizes. The ear climbers are very flattering, following the natural curves of your ear. Beautifully versatile - detach the tourmaline pendants & wear the ear climbers on their own when less glamour is required.